It’s been three years since the #FeesMustFall campaign erupted on campuses across the country. Thousands of students protested – at times violently – over rising tuition fees. On the back of frustration over the lack of funding for poorer students, the movement resuscitated, in a big way, the debate over whether South Africa should offer free tertiary education. For most individuals, the return on investment of a tertiary education is high. Take the unemployment rate. For graduates living in South Africa the unemployment rate in the second quarter of 2017 stood at 7,4%.2 Compare this with those with only a matric qualification (27,9%) and the overall national unemployment rate (27,7%). The logic of free tertiary education does seem attractive in this regard. If the barrier of cost is removed, more students will be able to enter the system, providing them with a much better chance of entering the workforce. The major difficulty, however, is that higher education funding needs a massive overhaul if tuition fees are done away with. Tuition fees finance almost a third of South Africa’s tertiary education budget, according to data from Stats SA’s latest Financial statistics of higher education report.3 That’s R22 billion out of a total income of R67 billion sourced during the 2016 fiscal year. 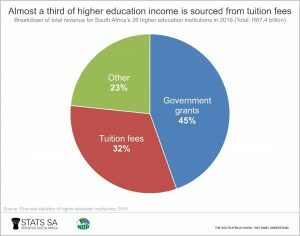 South Africa’s 26 higher education institutions, as well as government, will be hard-pressed to find money to fill that R22 billion gap if tuition fees no longer apply. The country’s universities and universities of technology were not always this dependent on students. In 2006, 27% of income was received in the form of tuition fees, rising to 35% in 2015. The latest data from 2016 show this contribution falling slightly to 32%, partly as a result of a rise in government spending and keeping fees unchanged in 2016. It’s too early to tell whether government is keeping to its second promise of an additional R17,6 billion, but the latest data from the Financial statistics of higher education report do show a significant rise in government spending. The amount of money transferred to higher education institutions in the form of government grants increased by R5 billion (or 20%) in 2016. That’s an additional R5 100 per student paid for by the state coffers, if we consider the 975 837 students currently enrolled in higher education. In fact, the additional contribution in 2016 is the largest annual rise in government grants since 2006 when Stats SA started publishing financial data sourced from higher education. In the wake of the #FeesMustFall campaign, the Commission of Inquiry into Higher Education and Training, also referred to as the Fees Commission, was tasked to investigate the feasibility of free tertiary education in South Africa. Expectations are that its final report will be released soon, and that it will provide some valuable insight and direction for a nation battling with a very perplexing problem. 1 Download the latest General Household Survey report here. 2 Quarterly Labour Force Survey, 2nd Quarter 2017, Figure 13 (download here). 3 Download the latest Financial statistics of higher education institutions here. 4 Higher education gets R17,6 billion boost over the next three years (read here). 5 Tuition fee trends over time: what do the data show? (read here).